Summer in England and sports-lovers' minds turn naturally to tennis, golf and cricket. One name that has been inextricably associated with these sports in the past is Slazenger, the well-known sports goods firm. Whether supplying tennis balls for Wimbledon, equipment used by the top golfers at the Open or being endorsed by England cricketers Jimmy Anderson and Paul Collingwood, the firm has enjoyed a high profile across most of the traditional summer sports. Yet while rugby probably wasn't a game usually associated with the Slazenger name, this feature flies a kite to suggest that one of the family who created the worldwide sports firm might actually have played international rugby union for England. Whereas cricket has spawned a whole cottage-industry of statisticians down the years, rugby lags a long way behind the army of number-crunchers and researchers who have tracked down the details and lives of every Test cricketer. Wisden has even devoted an entire section to the births and deaths of all the game's international players. Rugby, however, has no such complete list, for although this site's statsguru section makes a good fist of filling that void, there are many past internationals whose lives still remain a mystery. One such "unknown" appears on the roll of England's Test players as F Moss, who belonged in the 1880s to the Broughton club in Manchester. The club flourished after the amalgamation in 1877 of the Broughton Wellington and Broughton Wasps outfits. The Wellington was described as "a very smart club of schoolboys" and was credited with introducing the passing game into Lancashire. Broughton, incidentally, should not be confused with their local rivals, the Broughton Rangers, who were an entirely separate entity and joined the ranks of the Northern Union when the rugby codes split in 1895. Before that schism, derby matches involving the two invariably attracted crowds in the region of two to three thousand - pretty impressive for the time. Three Mosses, A, H and F Moss - brothers, perhaps? - often appeared as forwards in Broughton's matches according to press reports. The last-named became a Lancashire county player and was often specifically referred to in the Manchester press as Frank Moss - unusual in the days when sportsmen were almost always shown by their initials only. 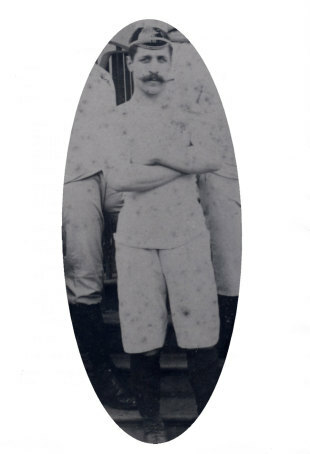 Lancashire's Frank Moss won the first of his three England caps in 1885 when he played against Wales at Swansea. He was retained for the Irish game at Manchester that year and played against Wales at Blackheath in 1886 in only the second international staged on the club's then new Rectory Field ground. Moss was always on a winning England side. Rugby's bible, Football: The Rugby Union Game edited by Rev Frank Marshall and first published in 1892, discloses very little about him. It states that he was "amongst the many prominent players hailing from [the Broughton] club". More helpfully, it shows him as F S Moss in a reference to a Lancashire county charity match against Middlesex staged at Kennington Oval in the presence of the Prince of Wales, later HM King Edward VII, in March 1887. That match, by the way, is believed to be the first rugby game attended by royalty. Now, the 1881 census for Manchester lists a Frank S Moss, aged 21, living in the Broughton area. Could this be the future England rugby international? The age certainly fits. This Frank Moss appears as one of many siblings living in Legh Street with their widowed mother, Eliza. Earlier public records show him as Frank Jacob Slazenger Moss, living among the same family in the Cheetham area of Manchester, where their father, Joseph, was a tailor and draper. It seems that the entire family had the Slazenger name, taken from an ancestor who had come to England from Germany before settling in the town in the late 1700s. Among this Frank Moss's siblings shown on the 1881 census were Horatio, Albert (the H and A of the Broughton press reports, perhaps?) and Ralph Moss. It is known that in the 1880s, Albert and Ralph moved to London where they set up the Slazenger sports goods firm in Cannon Street. Their brother Frank, meanwhile, emigrated to New York where he managed the US arm of the business and took out several patents on golfing equipment. In later years as their business expanded, Albert and Frank changed their names to Albert Legh Slazenger and Frank Legh Slazenger, disposing completely of the Moss surname while adopting the additional chosen name Legh, clearly after the Broughton street from where they had first set out as young men to make their fortunes. Frank Slazenger died suddenly, aged 78, at Bellgrade, Maine in the US on August 9, 1938. The evidence is loose and purely circumstantial, and to the best of knowledge no connection between rugby player and company tycoon has ever previously been suggested. But did the mysterious F Moss capped by England in 1885 and 1886 become a key member of the family that created one of the best-known names in the sports goods business?